Note: A review copy was provided by the author via LesCourt ARC Team. Afterburner is a novella penned by Lex Valentine and set a couple or so years before Don't Ask, Don't Tell Repeal in 2010. The story opens to thirty-eight-year-old Sebastian Marchetti a few months into his retirement from the Air Force and working on the planes for his family's air show business. The sudden appearance of a man wanting to rent the space that he says he rented before is the beginning of yet another change in Bas's life. 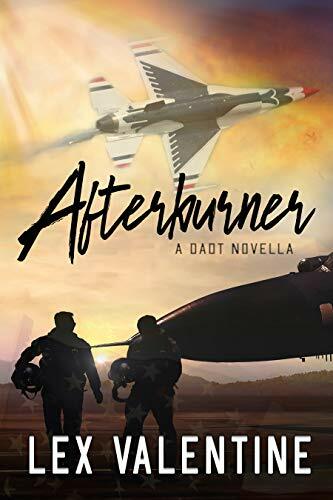 Thirty-six-year-old Ryder Beckett turns out to be the man who took Bas's spot on Plane 5 of the Thunderbirds, making him a still active member of the Air Force. The attraction between them is palpable and both decide to jump in and explore the possibilities of their connection being more. Their feelings develop quickly, but the looming shadow of DADT could be a hurdle too much to overcome. Learn more about Lex Valentine.